No, this isn’t a post about hockey; it’s about the future of one half of a city. The west side of Duluth has gotten a lot of deserved attention in politics and in the press in recent years. Rarely, however, do we hear much about the east side as a whole, except as a foil when comparing trends between the two ends of the city. This post will take some time to think about the area where I grew up, and plot out its future. This post came to my mind when I observed to a friend, half surprising myself as I did so, that I might well spend the rest of my life within a mile or two of where I live now. I’m probably going to be an east side lifer, and while I’m a big believer in roots and tradition and so on, the ties go beyond a lingering loyalty to the streets I ran while growing up. I’m a sucker for historic homes. I like having the easy access to transportation and cultural amenities that come with living in a city, but I also like to have yards and green space. I like being on a hill, though not necessarily on a slope that renders the yard difficult to use. I want to be around people who share my general ethos while at the same time not cutting myself off from those who are not like me. I’m loyal to the east side’s public schools, which I think provide as desirable a blend of high-achieving culture and exposure to reality as one is likely to find anywhere out there; I don’t know what they’ll look like in this balkanizing education world by the time I have kids to send to them, but I’d at least like to preserve that option. The St. Louis River has much to recommend it, but I’ve grown up looking at that lake, and I want to continue to have views of that lake. My main aim in doing this, though, is to make sure we don’t sink solely into a binary east-west way of thinking for all political discussion and reporting about issues in Duluth. I’ve certainly picked on that divide before; it’s real, and I’ll likely do it again. But it isn’t the only way of looking at things, and it runs the risk of ignoring other views that might be just as valuable. Part and parcel with this is the danger of thinking of Duluth alone, or as if the goal of balancing east and west must be the sole goal. 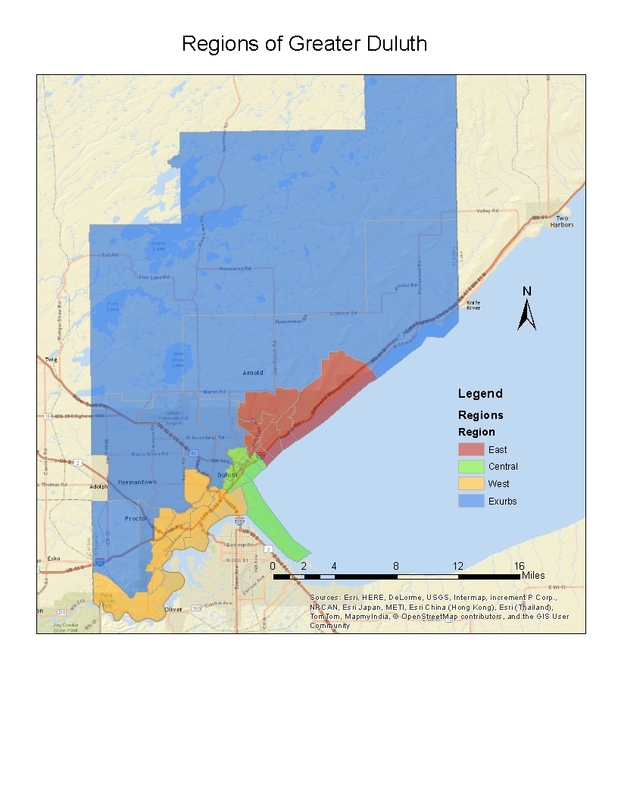 Less than half of the people living within thirty miles of downtown Duluth live within its city limits, and any solution to its various issues needs to consider the whole ecosystem. That requires both regional thinking, with an acknowledgment that noble measures in the name of balance could create perverse incentives for spillover or even flight into neighboring communities, and local thinking, with plans for specific neighborhoods instead of lumping entire sides of the city under one umbrella. The east side’s less defined identity may have something to do with the sheer variety that exists between 6th Avenue East and the Lester River. While the west side certainly has its variants as well, it doesn’t have quite as many dimensions as the east side. I’ve divided it into four areas, which I’ll summarize quickly with some essential information, then offer up my thoughts on where they should go in the coming years. This is the wealthiest patch of northern Minnesota, and that won’t change anytime soon. In a different place I might argue for less concentration of wealth, but in Duluth and at this time, I will defend letting Congdon be Congdon. Its roots run deep, historical deference preserves part of the city’s character, and it’s not so large that it can be an isolated enclave. (Congdon Elementary actually has more kids in poverty than Lester Park, as it draws from some neighborhoods further west.) It’s worth having a showpiece neighborhood, and also an aspirational one. This isn’t to say there isn’t room for improvement, and I think the city is particularly primed to cash in on the potential of some of the east side’s commercial corridors. There’s money to be spent in this area, and I expect many east siders from Congdon and beyond would welcome an excuse to do their shopping nearby instead of trekking up to the mall area. As I’ve written before, there’s so much room for improvement along London Road, and a chance to make it an actual destination instead of a bland suburban strip of medical offices and fast food. The new infusions of life with developments like Endi and BlueStone are great signs, as they offer convenient, accessible commercial options and housing for certain stages of life that don’t always get much attention. It’s no coincidence this is happening on the edges of Congdon, and it adds some healthy fresh life to the area. Next, there are the Woodland and Lakeside, old streetcar suburbs that I would argue are, by and large, exemplary neighborhoods. While they are wealthier than most of the rest of the area, they are hardly homes to lots of pretention. There’s variety, too: little downtowns with business districts, connections to both big parks and the rest of the city; some large lakefront or ridgetop homes for the wealthy and some naturally occurring affordable housing for the poor, comfortable homes for families and smaller ranches or ramblers for those in the starter-home market or the mobility-impaired. They both have neighborhood schools (though Lakeside’s is better integrated into the neighborhood), and even their own Catholic schools (though the diocese appears hell-bent on creating its very own little Red Plan and closing one of them). I grew up in Lakeside, and found it to be an excellent place to spend a childhood, with plenty of room to run free and a very healthy overall environment. These neighborhoods have enough in common that I put them together here, but they’re not identical; there are no lakefront properties in Woodland, and the college students in the Kenwood area drag down the median income up there. Maintaining the health shouldn’t be overly difficult, and simply involves keeping the housing stock fresh and gradually phasing in new stuff so it doesn’t age at a uniform rate. It sounds like some renewed emphasis on neighborhood downtowns will worm its way into the city’s new comprehensive plan, which would be a nice boost for these areas that are doing alright, but do have a few noticeable vacancies. Also, for the curious: Hermantown’s demographics are very similar to Lakeside’s. Duluth is a college town, and while a bunch of students scatter across the Hillside, Kenwood, and Duluth Heights, this is the big concentration. For an area including a decent-sized university, that’s actually a reasonably high median income. (The area around the University of Minnesota campus, for example, looks nearly as poor on a median income map as neighboring, poverty-stricken Cedar-Riverside; this gives me another opportunity to grumble about how the Census counts college students.) This goes to show the curious mix within Chester Park, and how quickly areas east of 21st Avenue go from apartments to very large and expensive homes. Good things have been happening in this area lately. Development of nice new apartment buildings and an actual businesses for college students to patronize (perhaps even—gasp—by foot!) has brought the area around campus out of the Stone Age. Continued efforts to make the universities more walkable self-contained will improve town-gown relations and improve the student experience. In all parts of the city, I’d support aggressive redevelopment of aged or declining housing stock; there’s a lot of crap out there, and I think this is the area where clearing some of that out and throwing up newer, better-planned stuff is least controversial for everyone. More apartments would get rid of some of these clown car homes-turned-apartments, could ease the parking problem with intelligent construction of lots or garages, and likely make upkeep easier. Then there’s the part of the east side that isn’t anyone’s idea of a den of cakeaters. Its borders aren’t rigid; I’ve written about the melting pot in my own Endion neighborhood, which wedges in between Congdon and Chester Creek, before. As with much of the west side, the elevation divide maps on to the income divide, and the housing stock gets progressively better as one goes up the hill. (In calculating the numbers, I chose not to include the awkward census tract that includes some stuff by upper Chester Creek, upper downtown, and that neighborhood above Skyline around Summit School; if I had, it would pull the median income up nearly $10,000.) Here, apartment buildings mix in with rowhouses and bigger homes that have seen better days, many now subdivided into apartments themselves. It includes the rather suburbanized Plaza shopping district, a little more scattered commercial activity than in the other neighborhoods, and one of the two large medical campuses in town. Here, the housing issue is more complicated: Duluth needs affordable housing, and Duluth also gains nothing from people living like sardines in rotting or collapsing pieces of junk. Hopefully the city’s newly announced plans to step up code enforcement can lead to cooperative solutions for everyone. If not, call in the wrecking ball for anything vacant, and set up a pathway for residents into safe housing that is up to code. There is some prime real estate in this area, and the dynamics of the local economy are such that I don’t think there’s any serious threat of displacement if the city does move to clear out the worst of it. There just isn’t enough money out there to cause a spate of teardowns followed by McMansion construction. Some selective clean-up, on the other hand, could improve a tight housing market and re-invigorate a neighborhood that too often feels on the shabby side. Those are just my thoughts, though, and perhaps the start of a conversation or two. Above all, my goal here is to acknowledge the complexity of the east side, and to get some thoughts moving on where its various parts go next, and how that fits into a regional plan. I’ve only got a lifetime ahead of me to see where it all goes, and offer my two cents along the way. After a minor delay, here’s a dip into the details of the latest election. As you may notice, my map-making skills have come a long way since I last did this. We’ll start with the closest race of the night, the battle between Alanna Oswald and Renee Van Nett for the at-large school board seat. Van Nett’s campaign had a more explicit emphasis on racial equity—even if it was a bit vague on how that was supposed to look in practice—which probably explains her success in the city’s most liberal districts on the east side and in the center of the city. She also may have benefitted from sharing a ticket with the popular David Kirby in District Two in the center-east part of the city. Oswald, meanwhile, focused more directly on east-west equity, which helped her carry the west side. Oswald’s more critical history of the administration and endorsements from the likes of Harry Welty also likely helped her out west, where skepticism of the administration is higher. Still, she was much more than an anti-establishment protest candidate, as evidenced by her success in places like Lakeside and the areas over the hill. She was a nuanced candidate who ran a strong campaign, and gave Duluth a rare upset of a DFL-endorsed candidate in a city-wide race. The main event of the evening doesn’t look all that thrilling; Emily Larson won every precinct in the city in the mayoral race. Still, the margin wasn’t consistent, and reveals the old east-west divide that has punctuated most two-horse races in this city for at least the past decade, if not longer. (Someone with a longer historical memory than a 25-year-old will have to weigh in on the older details.) These results suggest the east side is again driving the agenda, while the west comes along for the ride with varying levels of agreement. 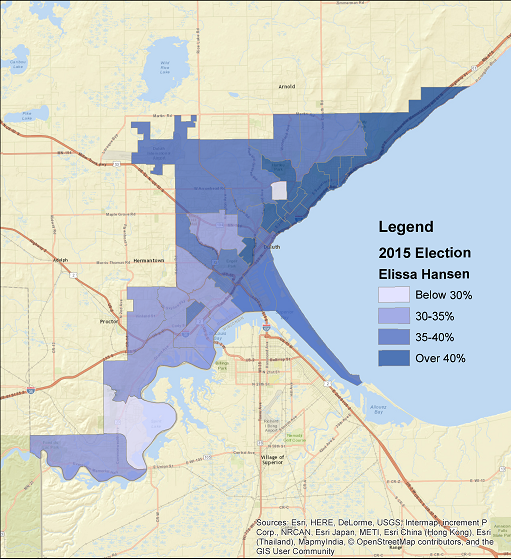 Elissa Hansen’s performance, 2015 city council at-large election. Noah Hobbs’ performance, 2015 city council at large election. In the city council at-large race, Elissa Hansen won all but four precincts, though her margins again tend to map on to the east-west divide. Like Larson, she is a poster child for continuing the Ness governing vision with her optimism, youth, and emphasis on inclusion. She lost three precincts to Noah Hobbs, and the two tied in the fourth. All four were pretty predictable: Hobbs, a recent UMD grad, carried the precinct on the UMD campus, and did the rest of his damage on the west side. Hobbs is a died-in-the-wool west-sider, so this only makes sense. (It wasn’t an accident that those lawn signs had Denfeld colors.) This is a second straight election that a younger person has eclipsed the establishment favorite on the west side, but I wouldn’t read anything too deep into this. Zack Filipovich simply had a stronger ground game than Barb Russ on the west side, and Hobbs’ ties carried the day on Tuesday. Jim Booth, a Duluth Heights resident, did best up in that region. As the relative conservative in this race, I thought he might do somewhat better on the west side, and while his percentages were somewhat higher, he still ran behind Hobbs nearly everywhere. An explicit west side focus outweighs any ideological loyalty. Anyone who seeks to speak specifically for that side of the city will do well. Sticking with the west side theme, these trends become more acute with if we hone in on the Fifth District race. Here, Jay Fosle beat Janet Kennedy by a fairly comfortable margin. 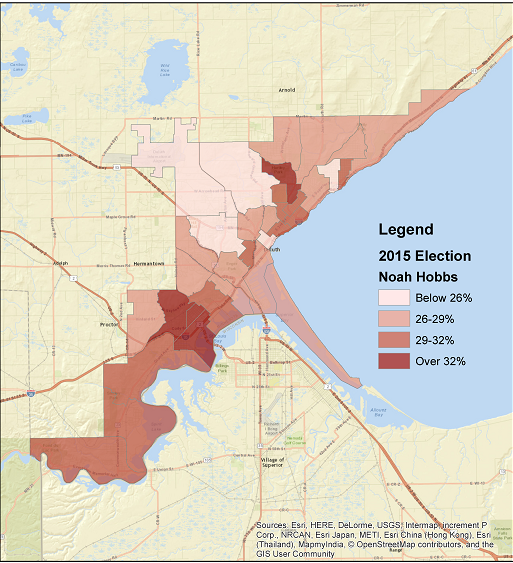 Still, the district has two clear halves: in the Denfeld and Oneota areas, Kennedy kept things very competitive; she was within 21 votes in the four easternmost precincts in the district. 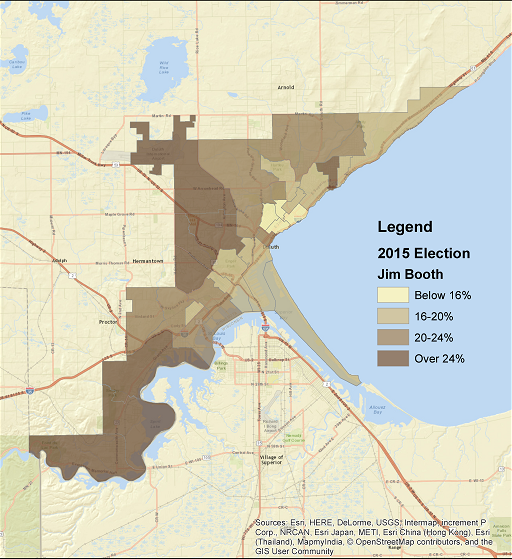 However, she got whipped in the far west precincts, particularly in Fond-du-Lac, Gary-New Duluth, and Morgan Park. This is Fosle’s home base, so it’s not stunning, and across the board, these very far west areas were some of the strongest areas for the more conservative candidates in the field. To the extent that the west side now has an anti-establishment reputation, it is rooted in the very far west. This may be a long-running trend, and the precincts in question are a small enough sample that personal ties for someone like Fosle can make a big difference. Still, this gap endures despite a very intentional effort by the Ness administration to launch a redevelopment effort in this particular corridor over the past two years. That’s significant, and shows that the west side, even if they like the leader of the River Corridor Coalition as a city councilor, still isn’t entirely on board. Once again, the west side wants to talk about west side issues, not the broader liberal ideas one tends to hear from the establishment candidates. At the risk of conflating a mild political divide and a much deeper discussion, the west side’s demographics hew to a recent attention-grabbing study on the plight of working-class white men. This group feels increasing alienation from the people in power, and whether this involves suicide or more insidious forms such as heavy drinking or drug use—a concern that Fosle, to his great credit, was waving in the face of the Council several years ago—they are dying at a faster rate than before. It’s certainly not hard to see how this affects politics. (See Trump, Donald.) These are somewhat more existential questions on the fate of the American Dream, some of which I’ve explored before, and that theoretical discussion needs to continue. In the meantime, though, cleaning up that steel mill site and other post-industrial dreck, building some new housing on the site of a shuttered school, and bringing some jobs back to the west side will have to do. 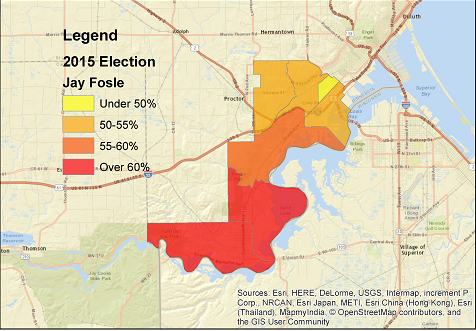 In the big picture, however, Fosle’s constituents have themselves a protest vote. Don Ness was not running for office on Tuesday, but he loomed large over the whole race, and his ethos reigns supreme. The city’s government is younger, and solidly on the left side of the political spectrum. Ness’s legacy will last long beyond his eight years in office, and while it will be many years before we can cast final judgment, there’s certainly more cause for optimism now than there was eight years ago. For most Duluthians, the trajectory forward was so obvious that it wasn’t really up for debate in this election cycle. Still, there is nuance here. Duluth rejected the vogue electoral system because it didn’t get caught up in the latest flashy trend with no actual evidence backing it, and that is a win. A mild upset in the school board at-large race shows some discontent with the direction of the school district, and a refusal to impose a single vision upon it without debate. There is room in the tent for east side liberals and west-side loyalists; for total believers in the Ness vision and a loyal opposition. The more open the process, the greater the odds that a portion of the city won’t get left behind. We’ll see what Emily Larson and friends do with that new mandate. See two more maps in a follow-up here. How do we tell the story of a city? The most compelling way probably involves walking across it, listening to stories and using one’s eyes, letting the stories tell themselves. I’ve done that for Duluth before, and historians more learned (and aged) than I am could do a much better job of reaching back into history to create something far better than a simple blog post. No one can really claim expertise without truly getting lost in the woods—in Duluth’s case, quite literally. And then there’s data. It has its limits. It’s been overhyped in an era when reams of it are available with a few easy clicks. Too often, it’s taken as destiny, its sweeping trends that elide the human dramas playing out every day, across the years and in ever little corner apartment or dead-end street on the hill. But it also takes all of those stories and boils them down into something we can see clearly, and allows us to better understand the broader forces that catalyze events in those lives. It lets us fly above the woods for a bit and see it all before coming back down to earth. This post uses U.S. census data since to tell the story of Duluth since 1970. I use tract-level data, which usually lines up roughly with neighborhood boundaries. The official map for 2010 is here. I also include the suburbs and outlying townships in St. Louis County; these are an essential part of Duluth’s urban evolution, and using longstanding city boundaries makes for an unhelpful cut-off for a dynamic process. (Someday, I might throw Superior and eastern Carlton County into the hopper, but this will do for now.) I won’t bore casual readers with the methodology notes, but if you want to know how I made these categories, there’s a section on this in the follow-up to this post, which also includes a bunch of supplemental tables. 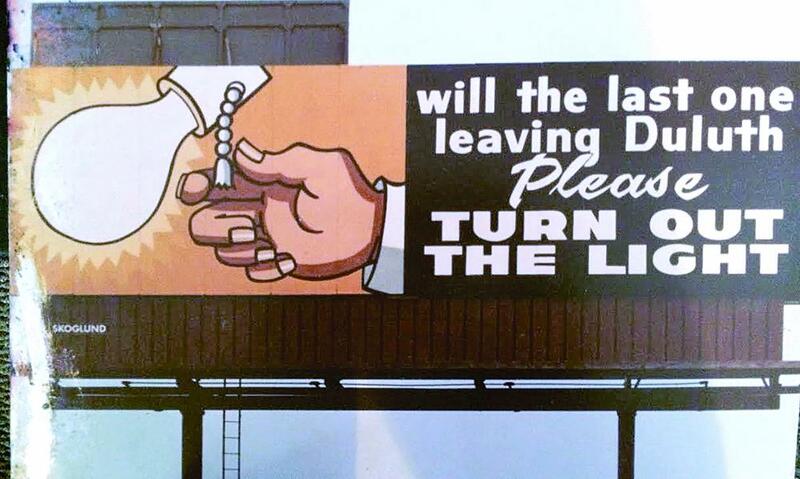 Actual billboard from Duluth, 1980s. Duluth News Tribune. 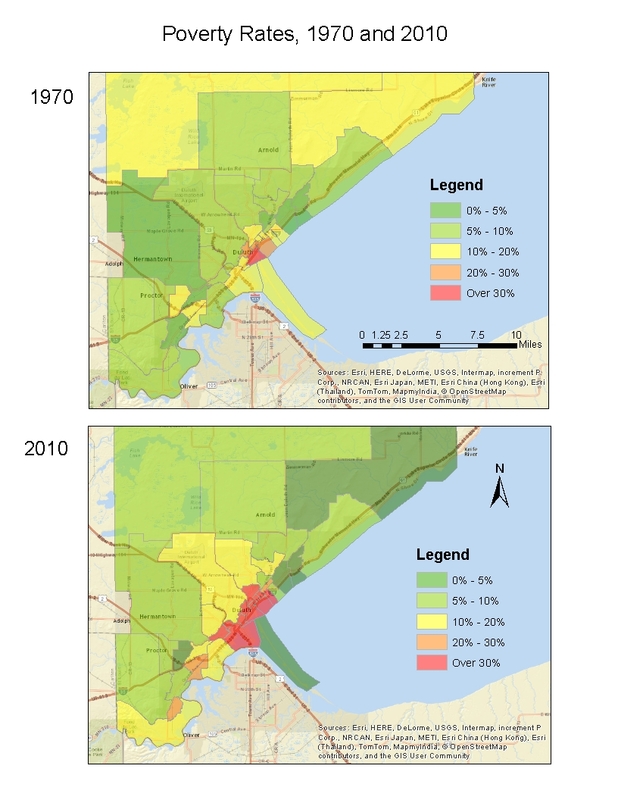 This forty-year span was not kind to Duluth. The area of study clocked in 121,398 residents in 1970; just 20 years later, it was down to 108,024. Poverty climbed across the board. This is also only a snapshot: the decline really begins in 1960, which was the high-water mark for the city’s population. Most of the second half of the 20th century was a depressing downhill slide, and stagnation followed before things began to tick upward again. To dig into the details, however, I’ve divided the city into four separate areas that tell different stories about the city and its changes: the east side, the center city, the west side, and the exurban areas. Each one reveals something different afoot in Duluth’s neighborhoods. After rock-bottom around 1990, though, things start to change. There’s stagnation in some places and resiliency in others; growing gaps in some areas, and dramatic rises elsewhere. Sure, the city’s population has barely budged, and the neighborhood descriptions a mid-90s real estate map I recently discovered—something a map-obsessed kid kept from his parents’ move to Duluth when he was in first grade—could have been written yesterday, and I doubt anyone would know the difference. Yet there are subtle changes here and there, and one has to look beyond the city limits to understand things, too. A couple of quick notes before we tour Duluth: I’ve tried to name the neighborhoods as they line up with census tracts, but I had to get creative in a few places. Apologies for any grave sins on that front, and check out the map linked to above to see actual boundaries. I’ll also add the necessary warning for all 2010 census data: most of it was collected in 2009, in the depths of the Great Recession, and it therefore tends to make things look a bit worse financially than overall trends would suggest. 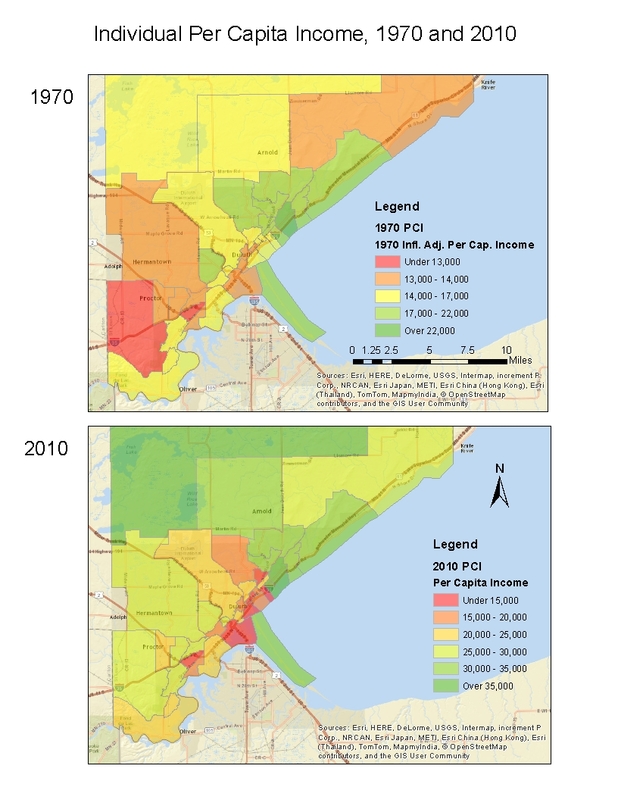 Like all of Duluth proper, the east side lost population over the 40 years, but the rate was much slower than in the rest of the city. Population loss is no great surprise in built-up neighborhoods, especially as family sizes decrease. The poverty rate has also held pretty steady, and the few changes have more to do with college students moving in than economic decline. With occasional variation in the difference, incomes stay ahead of the national average. The old streetcar suburbs of Lakeside/Lester Park and Woodland are steady bastions of middle-to-upper-middle-class comfort—I was surprised to see “Lakeside” (roughly 40th to 50th Avenues East) was the lowest-poverty tract in the city. Congdon, meanwhile, remains Duluth’s realm of highly concentrated affluence; if it were its own municipality, it would rank 13th in the state in per capita income, right behind some of the small, opulent enclaves along Lake Minnetonka. One of the more interesting tracts is East End, the area below 4th Street between 20th and 26th Avenues East, which lost a lot of population, but also saw a decrease in poverty and had distinct rise in per capita income. Many of the people who remain are in its grand old houses, and the longstanding Congdon area prestige has withstood Duluth’s post-industrial phase. 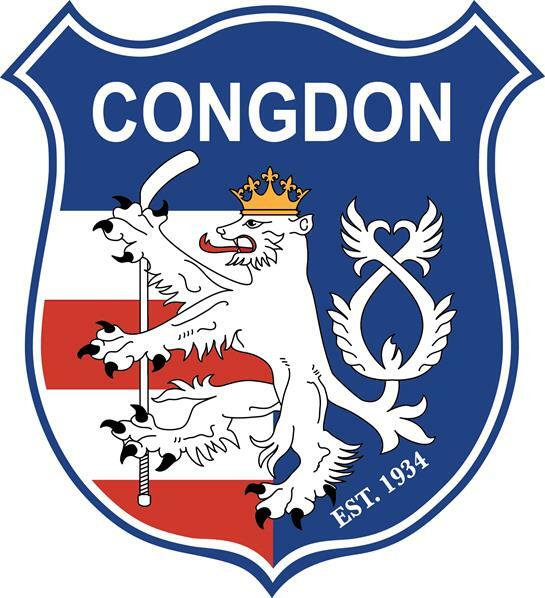 Congdon, summarized in one image. There were noticeable increases in poverty in Hunters Park/Morley Heights and especially Chester Park, though I’d hazard to guess that most of these are the product of growing numbers of college rentals in these areas. I included UMD proper in the east zone, so the school’s growth may help hide some population loss on the east side, though the wider impact of off-campus housing has clearly changed neighborhood dynamics in that area. And while the colleges may cause some decline in the neighborhoods that immediately border them, they more than make up for this by providing very stable, well-paying jobs, both for their employees and their graduates. Time will tell if new apartment developments in the area will stem the tide of converting single-family homes into rentals. The east side may no longer be the home of many captains of industry, but it has become the home of white-collar professionals, from teachers to doctors for the growing hospitals to the financial and government workers who run the city. Its income may flatline somewhat; there’s not a whole lot of space for development left, and barring aggressive redevelopment—of which there has been some—home values tend to decline with age. But the key anchors are all still there, most indicators are healthy, and there is little reason to expect any changes to this anytime soon. East will remain east. Central Duluth has been slowly hollowed out over the past forty years. It was at the bottom to begin with, but its poverty rate makes for a perfect scissors graph (to borrow a phrase from Robert Putnam), in which the plight of the poor gets steadily worse while the rich hold steady or do better. 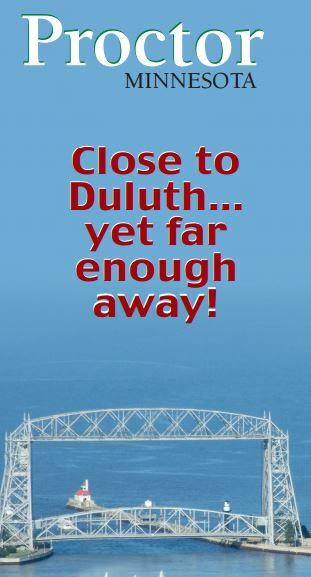 Duluth is often defined by its east-west gap, but its most glaring divide lies somewhere in the high teen Avenues East. The census tract with the highest poverty rate (Endion) borders the one with per capita income levels that would put it in the company of Edina and Minnetonka on a statewide list (East End). A chunk of the Endion, East Hillside, and Lower Chester poverty is probably college-related, but those poverty rates glide easily into the neighborhoods in the center of the city, which are undeniably Duluth’s poorest. There’s really no way to spin the statistics for all of these neighborhoods in the center of the city; most were fairly poor in 1970, and are now very poor and continuing to shed population. The one obvious exception is Park Point, whose beachfront lots have only grown more attractive to developers; Observation Hill has also rebounded enough to escape the “lowest” lists, most likely thanks to those fancier houses up near the ridgeline. One other eye-popping statistic, Downtown’s increase in population, dates to the first decade of the study, meaning the likely cause was the construction of high-rises like the Gateway and Lenox towers. It’s been mostly flat ever since. A tour of the Hillside today will reveal a few changes, from a few new apartments and urban gardens to some serious reclamation efforts of historic buildings, both by the city (as on downtown East Superior Street) and by intrepid owners. I don’t think it’s coincidental that some of Duluth’s most committed public servants, including current mayor Don Ness and his likely successor, Emily Larson, are Hillsiders: these people see several different paths for Duluth around them every day, and are committed to making things right. Things seem to be moving in the center now, with some new low-income housing that will do nothing to disperse poverty, but should at least improve living conditions. Downtowns around the United States are largely on the rebound, and Duluth may someday follow suit. Still, it won’t happen overnight. The most telling west side statistics may come in a comparison of poverty rates across time. 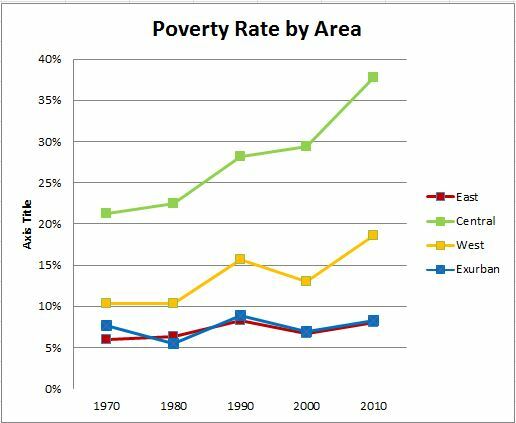 In 1970, poverty was pretty evenly distributed on the east and west sides; two of the four lowest-poverty tracts were out west, and with a couple of exceptions, they are low across the board. The west side wasn’t rich in 1970, but most everyone had access to decent-paying jobs and could stay out of poverty. In 2010, the script has flipped: only a handful of holdouts still have those low poverty rates. While not as extreme as the center, the gaps persist and grow. Things came apart with the collapse of the manufacturing base in the 1970s and 1980s. 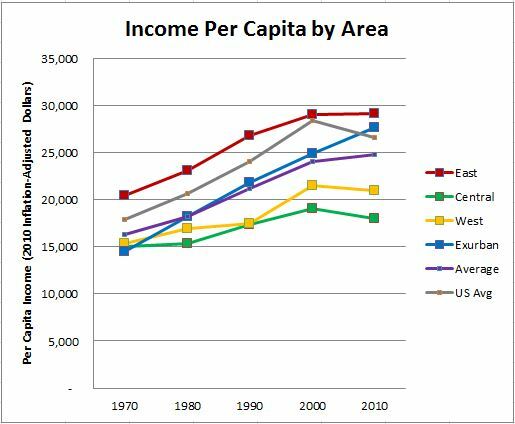 A comparison of per capita incomes over time shows fairly steady lines for most of the regions (and the nation as a whole), but the west side takes a sudden detour downhill in the 70s and especially the 80s, the decade in which the U.S. Steel mill in Morgan Park shut down. The west side has bounced back some since, but on the whole, it subtle scissors graphs show a trajectory closer to that of the poverty-stricken center than the steady east or the rising exurbs. This is the demise of blue-collar America in one simple graph. In 1970, these exurban areas had low poverty rates, but also low income rates; they were mostly basic rural areas where not much was happening. That means they’ve had plenty of room to go up, and have indeed dominated the lists of greatest ‘climbers’ ever since, both in population and income. Proctor and Midway Township have had modest population losses since 1970, and Rice Lake Township, which was already somewhat built up, has only grown slightly. Otherwise, these areas have all grown by 20 percent or more, and this growth has been accompanied by concurrent gains in wealth. (The only exception to that is the sprawling Kenwood census tract, which has the college population to contend with.) Especially impressive is the strong rise in income between 2000 and 2010, despite the effects of the recession. (The Duluth area as a whole actually held up quite well through the recession, as the center and west declined less than the national average and the east stayed even.) While only a few of them have cracked the “highest income per capita” list, they are on the way up, and poverty remains universally low. Duluth’s middle class, so hollowed out by the industrial decline, has been able to rebound somewhat in the exurbs, where land is cheap and taxes tend to be lower. So long as the regional economy grows, this trend should carry on. There’s still plenty of space out there, with the caveat that much of its allure stems from its rural character, and that could change as it gets built up. 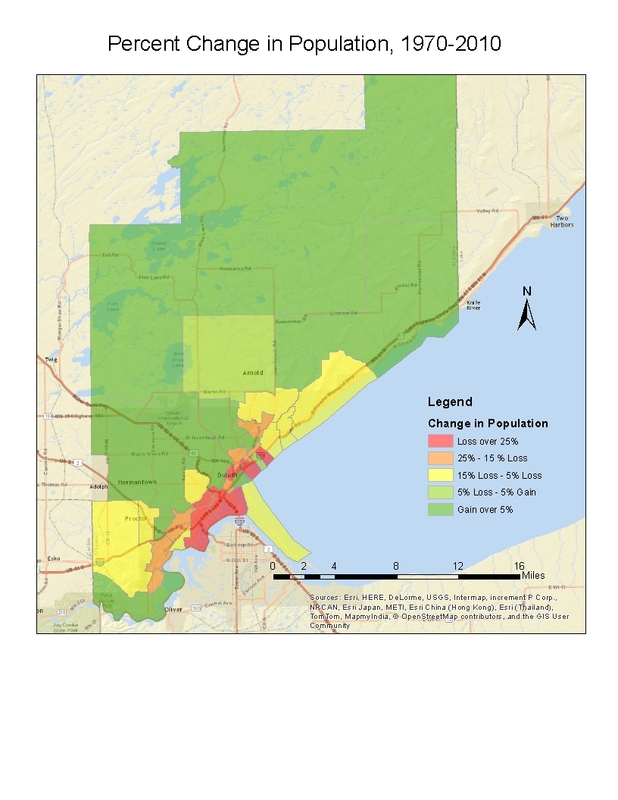 Poverty has made its move toward the inner suburbs in many larger cities, so it will be interesting to see if Duluth follows suit at all; Duluth doesn’t really have inner-ring suburbs, as it had stopped growing at the time most of those arose nationally. That may actually wind up being an asset, as neighborhoods with uniform housing stocks all decay at the same rate, and many Duluth neighborhoods (probably by accident) do a decent job of avoiding that. And while the exurbs have nearly closed the gap in income with the east side, I also suspect that may level off at some point; it’s not as if Duluth has a booming class of nouveau riche, and the pace of development isn’t enough to justify an explosion of McMansions that could topple Congdon from the top of the income list anytime soon. 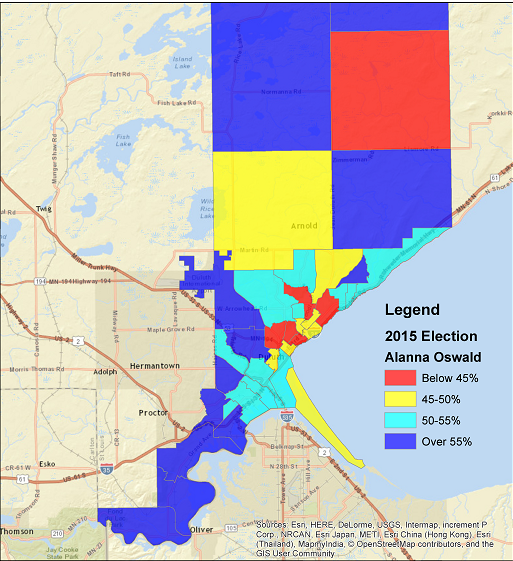 Duluth coexists awkwardly with its exurbs. Township members have forcefully rebuffed occasional attempts to annex territory, and the city has been largely inelastic over the past century. Predictably, township residents have little interest in paying taxes to prop up Duluth’s underclass, and predictably, Duluth points out how much these townships enjoy jobs, shopping, and cultural opportunities without paying to support them. It’s an endless cycle that has been played out in countless cities, though the state of the squabble is usually a good indicator of the economic health of the metro area. When the area is growing, everyone does better, and growth in one area need not come at the expense of another; when things are more stagnant, one’s neighbors become the easy targets for blame. 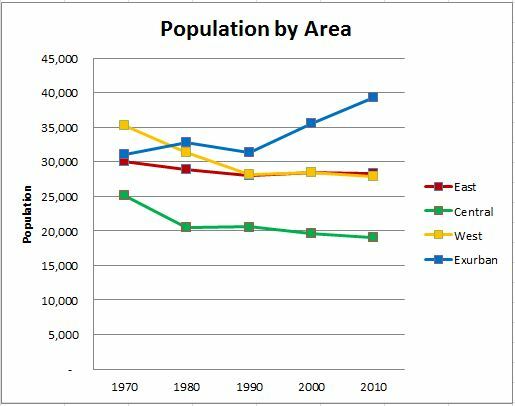 During the worst of the downturn in the 1980s, the exurban areas lost population, just like the rest of the city. Exurban growth is now reality, but stands to gain even more if the more downtrodden parts of Duluth can get back on their feet. It is not a zero-sum game. Not much here is wildly surprising to anyone who’s paid attention to these things around Duluth, but the numbers and trends throw things into sharp relief. It also fits pretty cleanly with the dominant narrative of American cities since 1970: widening gaps, the isolation of the super-wealthy, the hollowing out of the center, the loss of blue-collar jobs, the rise of the exurbs, and a new creative class. Duluth fits the general mold and that is unlikely to change, though it will be interesting to see if some of the Don Ness Era innovations can push Duluth to the vanguard of the changes instead of trailing along behind the rest of the country. The City of Eternal Air Conditioning is beyond the point where it can just ape the narrative of other mid-sized cities on the Great Lakes. It has to write its own. See Part II (Tables and Methodology) here. Over the past couple months, this blog has neglected any mention of Duluth affairs unrelated to the exploits of one particular hockey team. Time to fix that. I just spent a weekend back home, and Duluth is basking in sunny repose in mid-March, a rare feat that had everyone out enjoying the brownness of it all. (Why do these nice springs only happen when I’m elsewhere?) So, let’s see what’s been in the headlines over the past couple weeks, shall we? Okay, maybe nothing much has changed. I saw this coming from a thousand miles away back when the School Board launched its shortsighted inquest into its most stubborn member, and everything has, depressingly, played out according to plan. I’ll agree with Art and Harry that the state’s law allowing school boards to remove members seems way too loose. I’d support the effort to change that, and bring it in line with the standards used for other elected bodies. But unless his lawyers can prove unconstitutionality, a fight that would involve some very high-level courts, the School Board was within its right to exercise its power of removal so long as it found “proper cause.” The Rice Report as written gave them proper cause, and while Art and Harry have questioned Atty. Rice’s character, they’re going to have a hell of a time proving that. This leaves them with the possibility of questioning some of the testimony she relied on to develop that proper cause. Harry enjoys making dark allusions to the actions of one school administrator, but this would tip the case into a number of accusations in the shadows and he-said, she-saids. Is that really a winning case, especially when the other side actually gets to tell its story? I’m not very convinced. And frankly, if the accused party needs character witnesses, she’ll have some good ones. I could be one of them. I still think it was dumb of the School Board to go down this road against a mostly powerless Member, as Art will only drag this out in the courts forever and make it an even greater PR nightmare. I don’t know why any sentient voter would support any of the seven incumbents based on their conduct at the moment. But I also don’t think this debacle will prove the vindication that the anti-Red Plan camp seems to hope it will become, either. The whole affair is a pox on everyone’s house. I should’ve gone into education law. Seems like an awfully lucrative field. As you might guess, I am crushed, simply crushed, to learn that Howie Hanson has withdrawn from the mayoral race. It’s actually a pretty shrewd move on Howie’s part, and one that lets him get out of the race with dignity before it gets too heated. His odds were low, and this was not the stage for him. This allows him to dedicate himself to his seat on the City Council. Not having watched much lately I don’t know if he’s getting better or if it’s Same Old Howie, but he means well, cares for his residents, and, as one voice among nine, cannot do too much damage. This leaves Emily Larson alone in the race at the moment, though we still have eight months before the election. Names like Yvonne Prettner-Solon and Chris Dahlberg continue to drift about, but they’ll need to decide fairly soon if they want to have the resources necessary to mount a successful campaign. In the end, Larson may be the biggest winner from Howie’s very early entry into the race, as her quick answer allowed her to really get ahead of the pack and get her name out there. I still think this election is hers to lose. Let’s Sell Some Weed…Or Not. There was some controversy this past week over the creation of marijuana dispensaries in Duluth; the Planning Commission is going full speed ahead here. The City Council, on the other hand, hasn’t been such a big fan in the past. There were a number of proposed sites—near the airpark, Garfield Avenue, Lincoln Park, somewhere in or around Morgan Park. Not coincidentally, these are all on the west side. For the sake of the west side’s image, I hope it ends up in the airpark or on Garfield Avenue. The defenders of these sites say they’re all heavy-industrial areas anyway, which is true to an extent, but complexities of land use tend not to come into people’s minds when house-shopping. Saying “there is a pot dispensary in Lincoln Park” is probably enough. Granted, that might not be a turn-off for some people…but, let’s be real. Any rehabilitation of Duluth’s west side isn’t going to be led by a rush of people chasing a marijuana dispensary (unless Duluth goes all rogue and tries to become the Boulder of the North, but I don’t think that’s on the table right now). It’s going to need stable families to set down roots and repopulate the schools. Stick it by the airport or on Garfield. I’ve talked about this some before, too, but it’s coming to fruition: Duluth’s Edison charter schools are building a high school on the Snowflake Nordic Center site. My objection isn’t to educational alternatives (which I support in principle, from private and parochial schools to homeschooling), nor necessarily to the idea of charter schools (though there is growing evidence that, in time, they tend to just become destinations for white flight). It’s to the scale of the project. In a metropolitan area the size of Duluth, subtracting 600 students from local high schools is going to cause a fundamental disruption. Of course, the school will draw from numerous districts; ISD 709 Superintendent Bill Gronseth claims most Edison students nowadays go to Marshall, and now seems unconcerned, but I have a sneaking suspicion over who will be the real loser in this new setup: you guessed it, the school that draws from the area of Duluth right by the new school. Denfeld. The poor get poorer. Time will tell, of course. But the supporters of the Edison project are, in my mind, far too blithe and/or naïve over the likely effects of their new high school. This area is too small, and we are all interconnected. You do not live in a vacuum. Lest this post get too down on the west side, here’s cause for some potential excitement: we have some nice plans for the St. Louis River corridor redevelopment, most of them involving trails. In fact, if there’s a criticism, it’s pretty much all trails; the question becomes one of how to integrate all of these trails with the existing built environment, and how to capitalize on the new attractions. Still, there’s lots of encouraging stuff here, from skiing to rock climbing to horses to river access. There is plenty of ongoing investment in west side amenities. The question is, will genuine economic opportunity follow? Or is this just a cosmetic repair on the surface, one that ignores a collapsed economic base and a declining housing stock? I don’t have the answer there. Time will tell. For all my grumbling, it was good to be back. Nothing quite matches a Minnesotan’s delight as the coming of spring after the long, cold tunnel of winter. Enjoy your spring, Duluth. I hope to be back again before long. Yes, Duluth, I’m still paying attention to you, even from afar. Here are a few thoughts on two issues that have been in the news back home recently. Before we get into the merits of this particular plan, Tony makes one point that is especially bothersome when he floats the notion that this somehow detracts from the plan to revitalize the west side. This is the sort of attitude that reinforces the east-west divide, turning development into a zero-sum game. There is plenty of room for development on both sides of Duluth; nothing should be off the table simply because it is on a certain side of the city. Imposing some sort of moratorium on east side development so the west side can play catch-up would be a heavy-handed tool that would likely just leave us with less of anything in the end. Closing LPGC would actually eliminate an east side amenity, and if (if!) it is indeed a profitable move, could free up some cash for the west side. Signs of flexibility and openness to creative ideas would be a positive for the city as a whole, and could improve the overall development climate. Though Duluthians should be proud that their city tends to stop and think before rushing to throw up every new plan placed before it in shiny wrapping, this mindset is exactly what gets Duluth a reputation for being stuck in the mud when it comes to development. There’s room for many different options. I’m also not entirely sold on a number of his other defenses of LPGC. Yes, it’s public, and gives green access to golfers who can’t afford Northland or Ridgeview Country Clubs. But it’s also not a free amenity open to anyone, and calling a golf course ‘nature’ or an opportunity for serious physical activity is something of a stretch, especially in a city like Duluth. Golf courses are odd ducks in the planning world: they’re recreational, but very specific in purpose, and take up a lot of land area. Tony gives a massive job loss number, but it’s worth noting that many of them are seasonal and not exactly careers, such as caddying. These jobs are great for kids starting work and a few seasoned pros, of course, but it’s not comparable to closing a factory. Tony’s financial numbers seem fishy at best. It’s certainly not the government’s job to subsidize golf at whatever cost, and if the market’s not there, the local golf community either needs to pony up or face reality. It may be a bit premature to throw LPGC under the bus—Tony does have a not-so-very-old quote from CAO Montgomery dismissing any financial concerns about the courses that needs an explanation—but things do need to add up here. Tony has a pretty clear personal interest in LPGC, and while there’s nothing wrong with that—I’d be putting out some prolific venting if the city, say, tried to do away with Fryberger Arena—let’s not pretend he’s laying out these facts without a clear agenda. All of that said, barring an offer the city can’t refuse, I do think it would be shortsighted to just shut the place down and put up a new, strictly residential subdivision. Overcrowding at the Enger course would be a serious issue, as would the loss of a venue for major charitable events. Golf does have genuine cultural value, and generates some tourism. Weather might have played a role in recent financial struggles, and LPGC is also sadly burdened by the hopelessly arcane liquor sales ban that lives on in Lakeside. The public needs to learn a lot more about the course’s operations before it accepts that it just has to go. The good news is that some of the proposals apparently do not involve the total loss of the golf course. Preserving 18 holes while allowing for some modest development might prove a sensible compromise. Ideally, any redevelopment will maintain some parkland and public access to the excellent views along LPGC, no matter what fate befalls the course. The ideal plan would also probably bring some space for business along with it, instead of isolating a group of houses out on a cul-du-sac off Lester River Road. I’m intrigued to see what comes out of this. Tell me more. Oh, yeah, that thing. I’m afraid it still exists, and is just as absurd as ever. I made it about halfway through the Youtube video before giving up. It started off as usual, with Members Johnston and Welty doing lots of grandstanding for entirely understandable reasons, as they still have not been given any clear path to get anything on the Board’s agenda. Chair Miernicki continues to be the greatest PR operation the minority could have dreamed of on their behalf, persistently bumbling through everything. At one point, Member Johnston said that Chair Miernicki had told him that he was “scared” of him in an email, which is telling. Many adjectives could be applied to Member Johnston, a number of them not very nice, but “scary” is not really one of them. Years of battles have left the majority paranoid about the man, and even his more mundane critiques give rise to defensiveness. Everyone is so well-trained at taking those who they do not agree with in bad faith. This fear of minority critiques came out later in the meeting, when Member Harala lost her cool and snapped at Member Welty for his (real, but fairly mundane) grandstanding on minority students’ poor test scores. So much for the one person on the majority who I thought was making a concerted effort to see things from the other side. Predictably, this sent Member Johnston off the rails with accusations of harassment and lack of care for minorities, in turn sending Chair Miernicki into justified indignance. After that bit of ugliness, I stopped watching. Member Johnston said the Board has done nothing for underserved groups, but this is patently false. Whatever one thinks of it, the Laura MacArthur curriculum flap is obviously an effort to cater directly to groups that need extra help in school, and from my time there onward, there has been a very concerted effort on the part of the East administration to directly engage with minority students. (In fact, there were even a few jokes in poor taste about how this was the only thing the administration cared about.) I doubt East is unique there. Just because it isn’t being announced with trumpets doesn’t mean it isn’t getting done. Its efficacy may be another story, though, and everyone seemed to be in violent agreement that this is a conversation worth having. The trouble is that the conversation will likely go in the exact same direction. Members Welty and (especially) Johnston are full of depressing facts but short on solutions, in turn leading to defensiveness and qualifications from the rest. I’m all for the accurate reporting of the statistics, but just reading off the numbers does little to advance the conversation. Stupid as it may be, Members Johnston and Welty may have to cater to their colleagues’ fragile sensibilities if they really do want to have this conversation (which they already do somewhat with a lot of qualification), and some brevity might do them a world of good, too. Unfortunately, the success of Laura MacArthur may be leading some on the Board to believe that this is an easy problem to solve. Member Welty says he won’t be happy with mere incremental success, and the Board should obviously aim to do all it can, but in the end, I’d be relieved with some slow, steady progress. While he may just have been in a state after Member Harala’s outburst, Member Johnston’s suggestion that the achievement gap exists because people aren’t trying is just his bad faith reading of people he does not like. This is a brutally hard issue to fix. The same could be said of the east-west divide, which also came up in relation to test scores after everyone got all of their hating on testing and No Child Left Behind out of the way. (If there’s one thing that seems to unite everyone in the room, and can even get Chair Miernicki to praise some of Marcia Stromgren’s words, it’s a hatred of tests.) The concerns about equity between East and Denfeld came up again, and while I’ve already said plenty on that, I’ll again point out what a bind the District is in as it tries to correct for some of these issues. The new curriculum director has his work cut out for him, though as I suggested in that past post, there are some creative ways to offer greater equity while also working within reality. I’m not going to defend the Board’s existing efforts fully, though, and at their worst, some Members do sound like patronizing teachers when they acknowledge problems but do not share any further details, or dismiss them in facile ways. (See Chair Miernicki’s suggestion that, because something appears in the curriculum guide, this must automatically mean there is equal access to classes at both high schools. Please. And what is this nonsense about a full year of lifeskills—by far the most useless class I had in ISD 709, though that was perhaps related to the teacher—instead of offering Spanish at Lincoln Park?) It’s all part of the culture of secrecy inside the District. It may not look like it exists from inside the bubble, but it does, and it’s glaring. Read this DNT op ed and some of Harry’s correspondents for more details. The public speaker session included Linda Puglisi’s jarring story of a pool rescue, once again showing the horrors of teachers trying to do the best they can with large class sizes. Another speaker hammered this theme home when discussing Lester Park, and I’ve heard similar stories out of Congdon. Not coincidentally, these schools are on the east side; in addition to serving the area of the city with the most young people, they are the ones families are trying to transfer into, often blackmailing the District with threats of withdrawal if they don’t get their way. Even so, class sizes are still a problem, despite a few added teachers here and there thanks to the levy money. This Board has some work to do, and it needs to do more than “have conversations”–though in some cases, it isn’t even doing that. On that happy note, I’ll cut myself off. Writing about Duluth politics is cathartic. I miss it, in a twisted sort of way.